A fantastic work fragrance. Will not offend any one but will allow you to smell fresh and clean like a luxury bar of soap/fabric softener. I've received compliments while wearing this fragrance. Lasts a majority of the day however reapplying at mid day would be required if you want a prominent scent throughout the entire day. Very nice and clean day time scent. Prada L' Homme is a great fragrance. It not a strong but however its a very pleasant aroma, non-offensive. This fragrance gets me compliments all the time. It can be worn as a signature scent, a formal occasion, to school or out on a date. 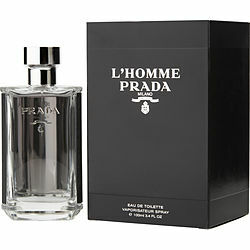 Better then Prada Absolu & Prada L' Homme Intense in my opinion. Prada L' home is awesome ! 'love the smell & the fragrance! Great perfume ! The smell last for a long time !